I had him by the scruff and carried him around the house for a good 20 minutes. I didn’t know what else to do. What I really wanted to do was strangle the little beast. But I had witnesses. What I mean is, we had company. I anguished over how I could even think this way – I loved cats! Milo had always been a naughty cat, right from the day we brought him home the summer before. He chewed cords, he wrecked furniture and he scratched things. But I wrote that off as pretty typical kitten stuff. What l would soon discover is that Milo had a fatal flaw – he was a pig. He started to beg for food incessantly, stole food right off the kids’ unmanned dinner plates, and would even eat raw meat directly out of the grocery bags. But this was, by far, the naughtiest thing Milo had ever done…. At one point in my life, making and decorating a cake could take me 20+ hours. Now-a-days my focus is on the inside of the cake, rather than decorations. 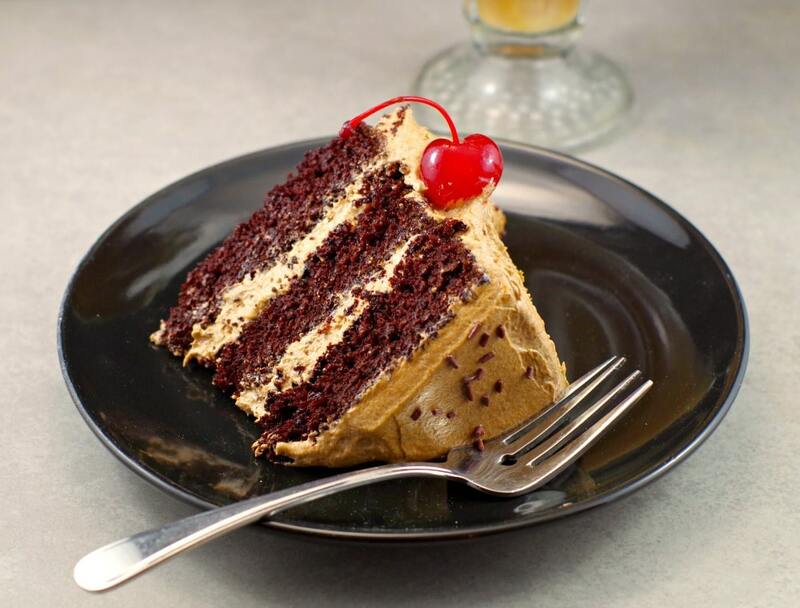 And this homemade Root beer float birthday cake has the BEST tasting insides! 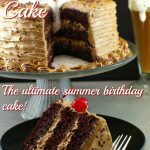 Whether you are a kid or an adult, if you like root beer, and you are looking for birthday cake recipes, you will LOVE this cake! I wanted to try a new technique (gravity defying), so I made this for my husband’s birthday a couple of years ago. It soon became his favourite birthday cake and he requested it again this year. It’s the ultimate happy birthday cake.
) that isn’t too sweet and is the best icing I have ever had – I use it for everything! I added the marshmallow fluff on top to make it look like the melting ice cream on a root beer float. 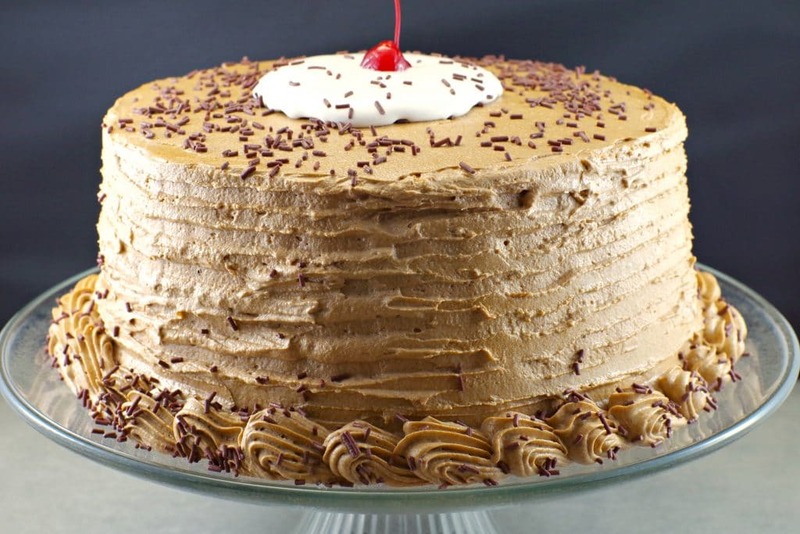 Although this root beer float birthday cake won’t take you 20 hours, it will take you a couple of hours. But trust me, the extra time is worth it. If you are looking for the ultimate happy birthday cake, this is it! I knew I couldn’t leave food out around Milo, so I had secured the cake in very large container with a lid and pushed it into the corner of the island. Little did I know, as we noshed outside, inside, over the course of 4 hours, Milo was slowly and strategically pushing that massive container of cake to the edge of the counter. I later learned that this was a tactic he had picked up when my husband worked late shifts, leaving his leftovers in Tupperware containers on the counter. Milo would push the containers off the edge of the counter and quickly deduced : if it falls to the floor, food spills out. This was a major score for a cat that is never sated. Below, on the floor, lay a twisted mass of marshmallow fondant, buttercream and vanilla butter cake. 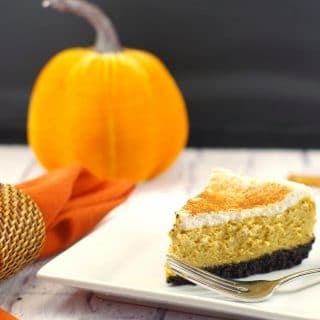 It was akin to the scene of a bad traffic accident – severed blobs of cake and icing where they shouldn’t be, broken flowers, almost unrecognizable, as I stood there, stunned and in a complete state of shock. “Oh no” and “I’m sorry “ is all my friends could muster, as we all just stood there, gawking at the wreckage. It didn’t help. It was awkward. I was frozen. That was, until Milo casually sauntered back to the scene, viewing this as an opportune time to pilfer some of that floor cake from the carnage. That’s precisely when I grabbed him by the scruff. My daughter began to cry inconsolably when she realized that the cake couldn’t be salvaged for her birthday party. Then as suddenly as they began, the tears ceased, her face lit up and she said, “Does this mean I can have a Menchie’s birthday cake? !” And just like that, all was okay in her world. My healing, however, took a little longer. It’s been a couple of years since that incident and since that time I have discovered that Milo generally enjoys my baking. So we don’t leave food on the counter, unless it’s fruit or vegetables because, as it turns out, Milo’s not a fan of anything healthy. I still made sure to hide this cake far away from Milo because although he’s done A LOT of naughty things since that day, this one still takes the cake. This root beer float cake recipe tastes just like a root beer float, but even better because it's a cake! And it's the ultimate happy birthday cake. Chocolate cake, flavoured with root beer extract, then painted in root beer syrup, making it super moist, with a light, fluffy and not too sweet shortening (Crisco) based icing. The cake is topped with marshmallow fluff to look like melted ice cream, with a cherry on top! If you are looking for birthday cake recipes, this is your cake! Add eggs, milk, oil and root beer extract. Beat on medium speed for 2 minutes. Slowly stir in boiling water and continue mixing for another minute or until combined. Pour batter evenly into 3- 8 inch prepared pans until 2/3 full. **Batter will be runny. While cakes cool, boil root beer in a heavy sauce pan until reduced by half. It will form a syrupy liquid. Brush warm cakes with the reduced root beer and let finish cooling. Put shortening in bowl of mixer and gradually add powdered sugar. Beat about 5 minutes until mixture is very creamy and fluffy. Set this aside. In a very clean bowl mix dry ingredients. Add BOILING water and immediately mix on high speed. Beat until stiff peaks form, about 8 minutes. When mixture begins to get stiff add root beer extract. Combine both mixtures and beat together for another 8 minutes. When finished, use a rubber spatula to down beat a little to remove some of the air bubbles. Frosting will be very light and creamy. Cover. DO NOT REFRIGERATE. Add the marshmallow fluff, then a maraschino cherry in the centre and sprinkle with chocolate sprinkles. Note: Video: How to ice and comb a cake *skip the refrigeration part, as this whipped buttercream should NOT be refrigerated! Yessss! 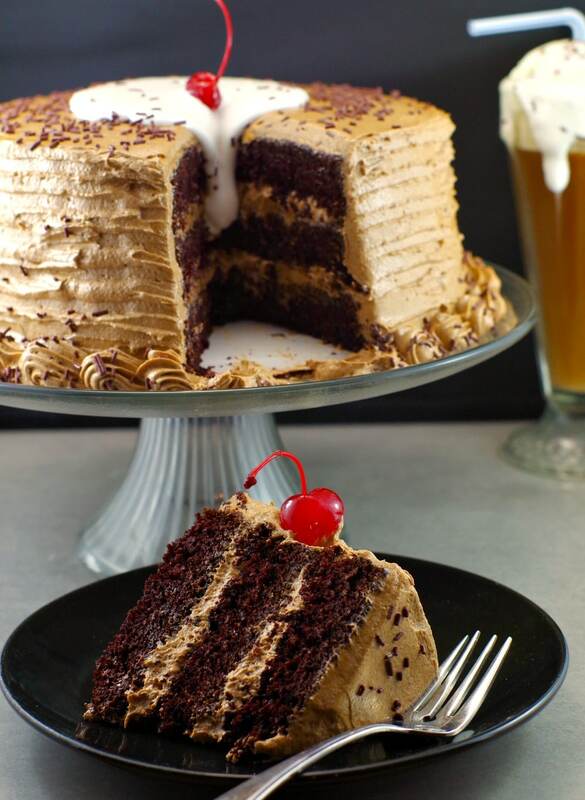 I mean come on, a root beer float in CAKE form!? It’s like the king (or queen) of all dessert forms! Need to try this one soon. Thanks, Karly – totally agree! I am afraid Milo would not survive if I had been the kitty owner and cake baker. 🙂 Looks delicious and I especially like the gravity defying cake. haha… thanks Sue! Yes, you gotta love cats to put up with Milo’s shenanigans, that’s for sure! My Dave also loves root beer floats – just ordered one two days ago. I’m bookmarking this for his birthday! I’ll have to remember this recipe when my sons birthday comes around. He loves rootbeer floats (who doesn’t?, lol). This looks awesome! Thanks, Natalie.. it is very yummy! Oh man, this cake looks amazing. I was a big fan of root beer floats as a kid, so this recipe is basically fulfilling all my childhood fantasies. Thanks, Jessica! Yes, Milo is a little bugger- he’s lucky he’s really cute. .. And we do take pleasure in torturing him with healthy food. Enjoy the cake! Hi Isabelle- well, I hope you and this cake get to meet one day :)! Wipe the house with an entire tenderloin?! Wow…sounds like Milo has competition for most mischievous cat. Made this today for my son’s birthday and his first response was that it tasted like a tootsie roll – it was delicious! Lots of work but well worth the effort when all is said and done. We went with the icing recipe on this blog and it was exactly what the cake needed- a light and delicate frosting to counter the richness of the cake. Definitely a file for other parties recipe for sure. Thanks for your comment, Dawn and I’m so glad you all liked it! What a naughty cat! My cat also love to spill his water bowl and push things off of counters but so far when it comes to baked goods he just tries to lick them and then wanders off when he realizes he doesn’t like human food. Beautiful cakes though! Hi Charlotte: Thanks! Yes, he is naughty….and sounds like you have a pretty naughty one yourself. They are lucky they are so cute, hey? I can’t wait to try… the extract I bought already smells soooo good. Just one thing to clarify,… do you actually put 2 cups of liquid in at the end, the boiling water and the root beer soda? I hope you like it! No, you put the 1 cup of boiling water into the batter (the last thing) then bake the cakes. While that is baking, you boil the 1 cup of root beer on the stove until it’s reduced to 1/2. Then you paint that on the finished cooled cakes and let it sit overnight, wrapped, in the fridge. I hope it works out well for you! 🙂 Let me know.. Happy baking! Thanks Terri… I just had to read a little closer… LOL! Thank you! Looks amazing, I’m going to make it for my son’s bday I think!!! Thanks, Laura – you will love it!